Dr Andrew Tresidder, Somerset Doctor since 1983 is passionate about Health. As Doctors we learn about 'car crashes’ (Illness) - but we dont learn about safe driving, good navigation, vehicle maintenance or road design (Health). Written for everyone, addressed to health professionals, "Health and Self Care" shares some simple truths that resonate at a deep level about 'what makes us tick and how to tick better'. Andrew is well known as an entertaining speaker with a serious message, both nationally and internationally. 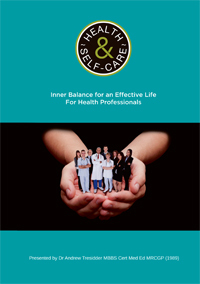 Health and Self Care is his third book, and has received reviews such as "An amazing piece’"of work (Health Education England), “A magnificent resource” (Swansea University Medical School), and “Andrew, thanks so much for sharing, it’s a masterpiece.” and “It’s really useful” from colleagues.